Popular hard-core route along scenic high cliffs. 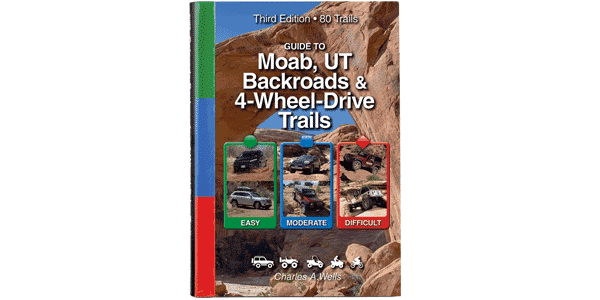 The first part of trail follows along a high rim with spectacular views of Arches National Park and the La Sal Mountains. It then heads west between Monitor and Merrimac Buttes along a technically challenging route to Wipeout Hill. From there it heads north past dramatic Determination Towers and exits via Tusher Wash. Optional trips to Uranium Arch and Wipeout Hill. Many other fun roads to explore on ATVs and UTVs. Add Wipeout Hill for maximum challenge. Something for everybody. Tougher lines for hard-core enthusiasts. Stock 4x4 SUVs with high clearance can take easier lines. One tippy spot along the south wall of Merrimac Butte is scarier than it first appears. Complex route-finding in places. Follow tire marks, white dashes and 7R signs. click here to preview guidebook.. Following the book at around 0.9 miles where you bear right, huge rocks fell down and are impassable. This is our "warmup" trail. Generally the first trail we run when starting a Moab vacation. It has stunning scenery and great over looks. The most challenging obstacles have bypasses, but you should consider the GPS tracks as the trail can be a maze. It is a great trail to break in new off-roaders. You will take lots of pictures on the Rim and between the two buttes.